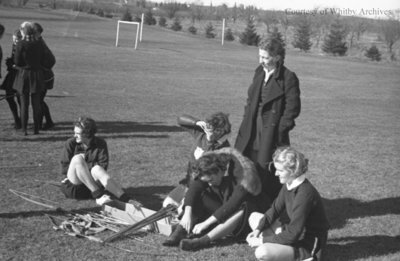 A black and white photograph of students at Ontario Ladies' College watching archery. The college was officially opened on September 3, 1874, by Lord Dufferin, Governor-General of Canada. Ontario Ladies' College Archery, c.1936, Marjorie Ruddy. Whitby Archives A2013_040_191D.